Mamata Banerjee’s love for paintings, Mayawati’s fetish for memorials, Bhupinder Singh Hooda’s alleged land dealings, Akhilesh Yadav’s alleged sand stealing, the accusations against the Congress in the AgustaWestland chopper deal and those of money laundering against Robert Vadra. These may not be the defining issues for the aam aadmi, who will vote for development, jobs and stability in the Lok Sabha elections. But, for the political class, the investigative agencies’ fast-paced actions in these cases signal the start of a vicious political battle in the last leg of Narendra Modi’s five-year rule. Public perception matters. Especially ahead of the country’s biggest elections. History has seen governments fall because of a single corruption scandal. The Bofors scandal brought the Rajiv Gandhi-led Congress down to 197 Lok Sabha seats in 1989 from 414 in 1984. Thirty years later, the cases are aplenty. But this time against the opposition. On February 3, West Bengal Chief Minister Mamata Banerjee pulled up a chair and sat on dharna on the streets of Kolkata to protest the Centre’s alleged misuse of investigating agencies to browbeat political opponents and control possible alliance partners. Most opposition parties joined her, in letter or spirit. 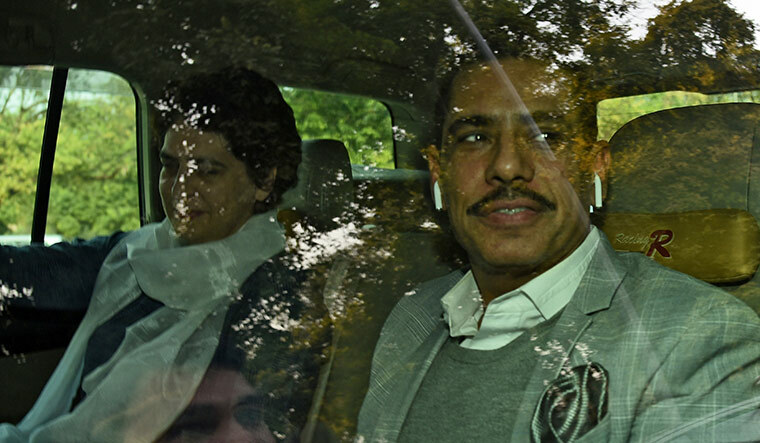 Then, on February 6, the knives were out when Priyanka Gandhi reached the Enforcement Directorate headquarters with her businessman husband Robert Vadra. He was there to be questioned about a money laundering case involving properties he bought in the UK. Priyanka dropped him off, and then took formal charge as the general secretary in charge of eastern Uttar Pradesh, sending a strong message to the BJP government. Vadra had moved a Delhi court on February 2 seeking anticipatory bail, and his counsel K.T.S. Tulsi had told the court that Vadra was ready to join the investigation as and when the investigating officer asked him to do so. Vadra got interim bail till February 16. The CBI, meanwhile, is preparing its second charge-sheet in the Rs3,700 crore AgustaWestland scam, which is based on the statements of alleged middleman Christian Michel and is expected to shed light on the “political beneficiaries” of the helicopter deal. 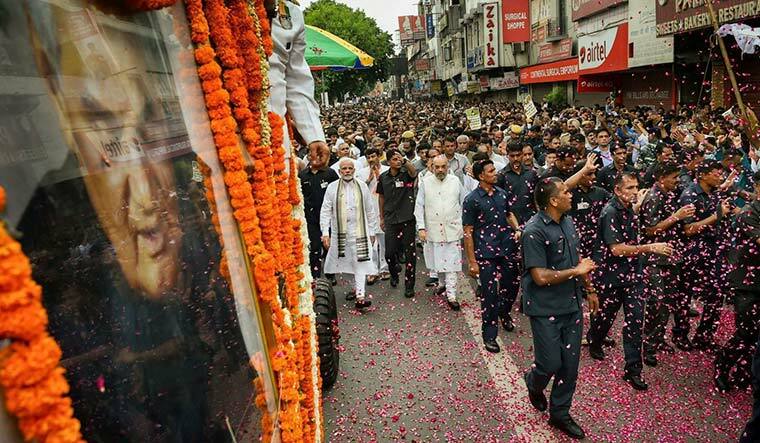 Prime Minister Narendra Modi, in his public rallies, has said that Congress president Rahul Gandhi has been losing sleep, fearing revelations that could land the Gandhi family in trouble. All eyes are on the timing of the charge-sheet, which could come any time. Mamata has accused the BJP of staging a political coup by sending a CBI team to arrest Kolkata Police Commissioner Rajeev Kumar without the state government’s knowledge or approval. Last November, the Trinamool government had withdrawn the “general consent” given to the CBI to carry out searches and operations in the state. Mamata had taken her cue from Andhra Pradesh Chief Minister N. Chandrababu Naidu, who had done the same after quitting the National Democratic Alliance earlier that month. CBI sources said the agency had served Kumar several notices to join the investigation into the Saradha chit fund scam and make himself available for questioning. Kumar had led the special investigation team that was probing the chit fund scam in 2013. After the CBI took over the investigation in 2014, it asked the SIT for some important case documents and related material. But, on getting no response from Kumar and on the suspicion that important documents were removed, the CBI planned a “secret operation”; it sent a team to Kumar’s official residence on February 3, sparking the current controversy. The role of national security and investigating agencies during an electoral churn has always been intriguing, be it the FBI’s role under the Donald Trump government or the CBI’s role under the Modi government. According to CBI sources, its officers could not carry out their “secret operation” as some Kolkata Police officers got a whiff of it. They not only obstructed the CBI team, but also manhandled the officers and witnesses, and took them to the Shakespeare Sarani police station, said CBI sleuths. Then, the Kolkata Police surrounded the house of CBI joint director (east) Pankaj Srivastava, who was handling the case. Srivastava was hosting a relaxed dinner for some of his IPS batchmates, some of whom had walked in after a Sunday evening stroll. Among the guests was his senior Manoj Lal, the boss of the subsidiary Intelligence Bureau unit in the state. A senior officer who was inside Srivastava’s house said that his family felt “terrorised” and they had never witnessed such a clash between law enforcement agencies. The unprecedented siege lasted three hours, and set alarm bells ringing in the Union home ministry. Apparently, the situation came under control only after the ministry intervened. By then, another crisis had erupted. Mamata, breaking all protocol, sat on a dharna on the streets of Kolkata, and got a lot of media attention. Home Minister Rajnath Singh, worried, told Parliament that there may be a constitutional breakdown in West Bengal. On February 4, the CBI approached the Supreme Court, which ruled that Kumar could not be arrested, but that he must join the probe and meet the CBI officials at a neutral venue in Shillong. Both the Centre and Mamata claimed moral victory. Rajnath Singh told THE WEEK that the developments in West Bengal were extremely unfortunate. “India’s strength lies in its federal structure and it is the duty of both the Centre and the states to work together and demonstrate cooperative federalism.” He trashed allegations that the CBI was being misused for electoral gains, and said that the agency’s actions in Bengal were “independent”. Home ministry officials pointed out that the CBI raid in Bengal happened on the eve of the appointment of the new CBI director Rishi Kumar Shukla, and at a time when Parliament was in session. “Why would the government want a furore in Parliament? The new director had still not taken charge. All allegations of political vendetta are baseless,” said a senior government official. But an unrelenting opposition, led by Mamata, has decided to launch a nationwide protest in Delhi, reportedly on February 13 or 14, against the CBI’s “political witch-hunt”. 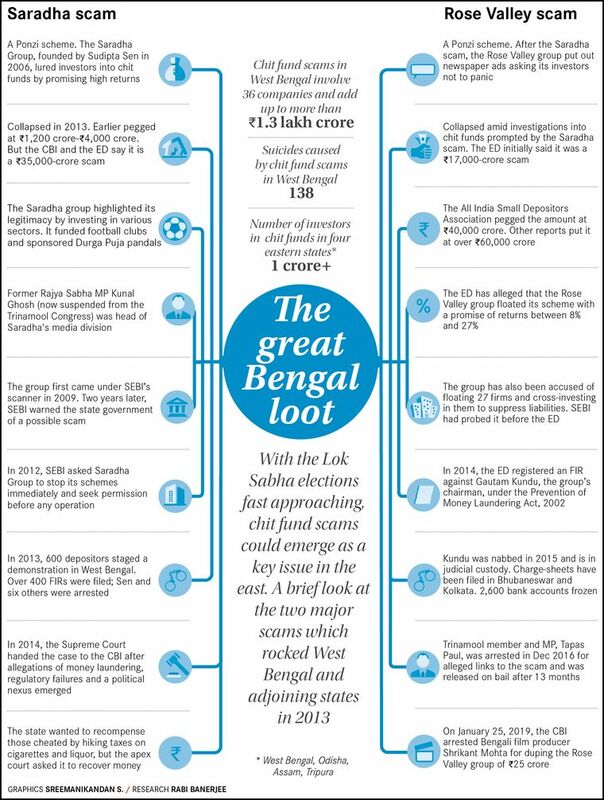 Sources said the CBI is in the process of gathering crucial evidence against senior Trinamool leaders and some government officials to establish a quid pro quo in the Saradha scam. Among them is Mamata’s close aide Manik Majumdar, who manages the party’s funds. Apparently, he also knows a lot about Sudipta Sen, the main accused in the Saradha scam, buying Mamata’s paintings. Sources in the agency added that while the role of some politicians in Odisha was also being investigated, they are yet to find any links in Assam and Tripura. In other states, opposition leaders are preparing themselves for other “special operations” of the CBI. For instance, Samajwadi Party president Akhilesh Yadav. The CBI had, on January 2, registered an FIR in an illegal sand-mining case, and though he was not named in it, Akhilesh’s involvement in the case is under the scanner. The CBI raided several locations in Lucknow to confirm if Akhilesh, who held the mining portfolio in 2012-13, was guilty. Later that month, on January 17, the ED registered a money laundering case against Akhilesh in connection with illegal sand mining. Tiwari added that the BJP had a “serious handicap in the Hindi heartland, and that its only alliance partners were the CBI and the ED”. In its FIR in the illegal sand-mining case, the CBI said that from 2012 to 2016, then district magistrate of Hamirpur—in criminal conspiracy with mining officers, state officials, some private lease holders, unknown public servants and other unknown persons—allowed illegal mining of minor minerals in the district, causing loss to the exchequer and undue gains for the conspirators. The investigation revealed that government servants had not followed the state government’s e-tendering procedure, and had allowed some people to even extort money from the lease holders and from the drivers of the vehicles transporting the minerals. “The role of the then mining ministers may be looked into during the course of the investigation,” said the CBI. Interestingly, while one CBI team was conducting raids in Lucknow, another was raiding 20 places, including Chandigarh, Rohtak, New Delhi, Gurugram and Mohali, in connection with irregularities in a land deal allegedly involving Congress veteran and former Haryana chief minister Bhupinder Singh Hooda. On January 25, the agency booked him in the case. Speaking to THE WEEK, Hooda said it was a “complete witch-hunt” by the CBI. “There is no evidence with the agencies. It is only political vendetta,” he said. On November 1, 2017, the Supreme Court asked the CBI to investigate alleged irregularities in the acquisition of 1,417.07 acres, between 2009 and 2012. The CBI’s preliminary enquiry said that Hooda and an IAS officer, who was then heading the town and planning department, had allegedly hatched a criminal conspiracy with private builders to cheat the land sellers. Sources in the agency said the government had issued notifications for land acquisition, triggering panic sale of plots to private developers at rates lower than that in the market. Interestingly, BSP president Mayawati is also on the ED’s radar. The agency has suddenly shown interest in investigating whether money was laundered in the construction of memorials—featuring statues of party icons and elephants—during her tenure as Uttar Pradesh chief minister. On January 31, the agency had searched six locations in Uttar Pradesh in connection with the alleged memorial scam, reportedly worth Rs111 crore. Apparently, there were alleged irregularities in the purchase of the stones for construction—same-quality stones were bought at different rates—during Mayawati’s tenure as chief minister (2007-12). The ED registered a criminal case under the Prevention of Money Laundering Act based on an Uttar Pradesh vigilance department complaint from 2014. Interestingly, each of these political “targets” is likely to give the BJP a tough fight in the Lok Sabha elections. While Mamata is stonewalling the saffron march in the east, the SP and BSP have joined hands in Uttar Pradesh to isolate the BJP. In Haryana, which the BJP won for the first time in 2014, Hooda is working on a way to return to power. At the national level, the Rahul-led Congress is being projected as an alternative to Modi, and many opposition leaders are trying to stitch together a rainbow coalition to defeat the BJP. Moreover, the opposition is gunning for the BJP over the Rafale deal. The Congress demanded a joint parliamentary committee inquiry, which the Trinamool Congress and the Shiv Sena, a BJP ally, supported. As of now, both the CBI and the ED have their plates full. But it remains to be seen which way the agencies turn in the next few months. In 1989, V.P. Singh formed a coalition government after putting the spotlight on Bofors. Will 2019 see a sequel?